It's frustrating when I occasionally run across one of my grandfather Pierre Ménager's paintings up for auction at e-bay. I always seem to arrive too late to bid! 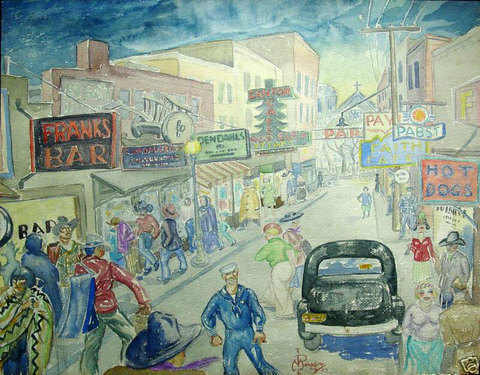 Here's a beauty from 1943 -- a watercolor of a crowded Santa Fe street scene. Everyone seems so busy, from the sailor home on leave, the dark-hatted men striding briskly or lounging against walls, to the zaftig women bustling across the street. The signs are lit up like a Friday night, offering food, drink, a place to cash checks, and for the sober, The Faith Café (just behind the Pabst sign!). It's interesting to compare this one to another painting he did of the Zuni Shalako Ceremony -- both paintings share the same exuberant street activity, diminishing to a point at the distant center of the painting -- which is an image of a sacred place, whether church, or a trio of Zuni gods. I love the way he infuses the ordinary material world, its humor and humanity, with the divine. "In the summer of 1940, and in anticipation of an estimated 60,000 to 100,000 visitors to Madrid during the holidays, an artist in Santa Fe, Pierre Ménager, envisioned the Ortiz foothills as the walls of an outdoor cathedral where the story of the Birth of Christ would be depicted in humongous dioramas. On 6,000 square yards of canvas, Menager hand-painted twelve major biblical scenes, one of which was a thirty-three foot tall figure of Christ. "Lighting the dioramas entailed building miles of road over the rocky, steep terrain. Over 200 men strung twenty-plus miles of electric wire for the 41,000 bulbs and 1,500 search and spot lights. Illuminating the City of Bethlehem, a miniature replica measuring 75 feet long and 18 feet high, challenged their ingenuity. In addition, electricity for lights on decorations, Toyland’s moving displays, and a loudspeaker system for Christmas carols, and the mine’s daily use, the energy maxed out the company’s generators pumping out one-half million kilowatts of electricity to the tune of $50,000. "When Governor John Miles threw the main switch on Christmas Eve in 1940, folks from surrounding communities and practically every state in the union watched in awe as the biblical pageantry flooded with light." "As a matter of fact, it was back in the early 1940's Walt Disney came to Santa Fe to visit Madrid at Christmas time to see the famous lights of Madrid and to visit with his friend, Pierre Ménager, who at one time worked at the Disney studios at Burbank, California...and did you know that the person who designed these fantastic figures to delight the children, was our own Pierre Ménager, a well-known artist? Pierre's heart was in this work and he worked with great pride to create this Disneyland for our community -- our Disneyland of long ago. Our Disneyland was free! Everybody came, nobody paid. The Lights of Madrid and the fantastic Toyland for children designed by Pierre were known over our nation and the TWA planes would detour to fly over the little mining town of Madrid to give the passengers a thrill." What I would give to see have seen the sight! I think I am going to have to make a trip over there and see if anything remains of the work, maybe at the Historical Society. But if you know anyone who might have photos from that period (parents? grandparents?) or who might have attended the event, please drop me a comment here as I would be glad to post it. By the way...the festival is still going on. "Actually, two other artists were the first to do the dioramas. First, Paul Lantz and later Carl Von Hassler worked on the Christmas displays. I suspect that they were discovered and became too expensive for the mining company. Each Christmas the displays got more and more impressive so your grandfather oversaw the really spectacular displays. Most of the displays were sold to the city of Gallup. Unfortunately, the displays were destroyed in a fire at a warehouse there."